In this post I share the Tarot Readers Dilemma I faced on a daily basis, when I worked as a Telephone Tarot Reader and why I eventually gave up Telephone Tarot Reading to set up this Email Tarot Reading Site. 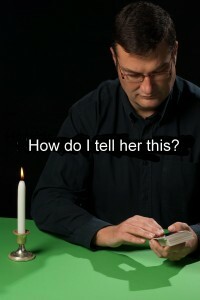 The caption on the picture above encapsulates something I often faced in my work as a Telephone Tarot Reader. The challenge came when I had to convey information to a person on the other end of the phone, who I knew with absolute certainty did not want to know what I had to tell them. Often I felt more like a Politician or a Councillor than a Tarot Reader. How to convey unwanted information in a positive and uplifting way? 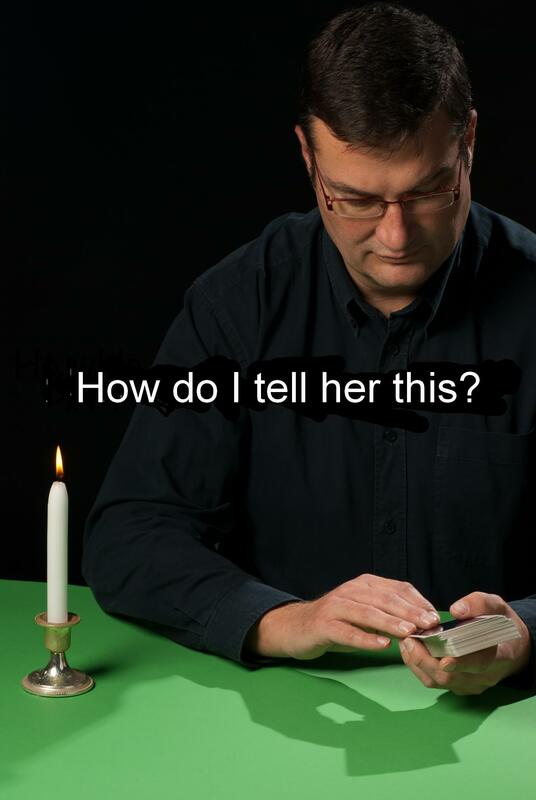 This I consider to be the Tarot Readers Dilemma. Actually over the years I became quite good at doing this. Being upbeat was essential. If I felt low or a bit ill myself, it was almost impossible to do this. It may surprise you to learn and it certainly did me, that very few people who want a Telephone Tarot Reading are doing it for a joke or a bit of fun. 99.9% of the time I was dealing with troubled people who had no one else to turn to. Now that is a hugely responsible job! I did feel very responsible and often agonized that I had said the wrong thing. There was one man in particular, let’s call him Sam, that I can give a lot of credit to, for ending my Telephone Tarot Reading Career. Sam’s girl friend had left him and Sam wanted to know whether or not she would come back to him. Now, Sam told me that he had talked to the most gifted Psychics from all over the world about this question and that was a bit daunting. Sam was absolutely convinced that his ex girl friend would come back to him. So much so, that I became equally convinced, that you certainly didn’t need to be Psychic to know, that he had probably driven her absolutely mad and no wonder she had left him. I felt there was very little chance that she would come back to him and very gently told him so. However, he obviously wasn’t convinced and he returned for more Readings, practically every day, yes very good for business I am sure….very long calls too. In the end I was so worn down by him that I gave in and actually agreed that she would come back! After that I decided I couldn’t bear the work any longer. So, thank you Sam, for without you I might not have ever set up this Website and become involved in Email Tarot Reading which I thoroughly enjoy. Yes, The Tarot Readers Dilemma also exists when giving Tarot Readings by Email, but I find it much easier to tell someone something they don’t want to know or acknowledge, in the written word at a distance, rather than in the spoken word over the phone. Also, I can edit and re-edit my sentences and if I feel a bit low, can wait to give the Reading till I am feeling positive and inspired again.